Today is December first. We are now in full blown Christmas mode. December is busy for most of us because there are extra holiday events added to our already full calendars. I am assuming that, like me, all of you crave a peace filled Christmas season. 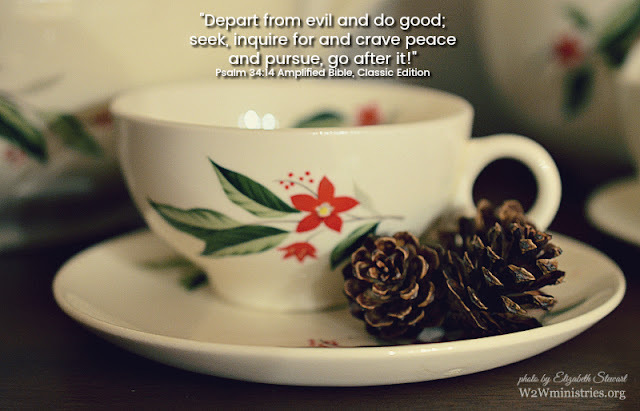 If peace is our portion, then what does it mean for us to pursue peace this season. Prioritize time in God's presence. For me, I am unable to remain full of God's peace if I don't spend time in God's presence. My morning quiet time is essential. As I mentioned in last week's post, God is showing me not to focus my morning devotions on checking off a certain amount of Bible reading or making sure I get through my whole prayer list. It's about making sure I am connecting relationally with the Father, Son and Holy Spirit. I want to worship Him, let Him fill me up with His love and peace, let Him search my heart for things that need His transforming touch. Prioritize consulting God about my plans and asking for His help. During my morning quiet time, I also go over my bullet journal which contains my to-do lists. I ask God to order my day. This is important every day, but extra important on busy days. Anxiety and the feeling of overload results if I don't give Him the list of to-dos and ask Him to take charge and to help me prioritize what He sees is best. It ALWAYS works when I do this and I am always surprised at what God helps me to accomplish. Prioritize being present with the people in my life over presents and plans. Another area that I have to be conscious of prioritizing in order to remain peace filled is to prioritize presence over presents and people over plans. Our family, loved ones and friends need us to be present with them more than they need a present from us. And, if December is so jam packed with busyness that I don't have time to take my youngest grandson for a stroller walk, to play a game with my four year old grandson, to hang out with the older grands, to have coffee with a friend, to go on a date with my husband, then it's just too busy and something has got to go. Prioritizing for me means that I've got to have some empty space on my calendar as well as some time with family and friends penciled in. Nothing I've written today is new or earth shattering. But, it's a good reminder to me, to us, to keep the main thing the main thing this month. Love God. Love people. Pursue peace. I love that these are all action words...seek, do, inquire, pursue, depart...it's not enough for us to sit back and wait. We must do things in order to achieve peace. Even though I've been much busier than usual lately, I'm finding the ability to prioritize has become easier as I age. It could be due to experience and/or learning from past mistakes, but I hope it's because I tend to rely on the Lord more now than I did when I was my younger self. He has proved Himself over and over to me as I've navigated the paths of life, and I hope I've learned a thing or two along the way about what it means to really trust and obey Him. I'm so glad you started with prioritizing time in His presence. That is essential for me. This speaks peace to my heart. Great thoughts and a reminder of what is important. Beautiful photo and devotion! Sharing on Twitter and Pinterest.